We are currently seeking a dynamic, and innovative Registered Nurse who really cares about the patient experience and the delivery of quality patient focused care. On the Surgical Assessment Unit (Ward 33/34) we have 38 beds and a Clinic Area where we see a number of patients to be assessed and treated. We have a wide variety of Nursing specialities on the Ward ranging from General Surgery to Bariatric Surgery. 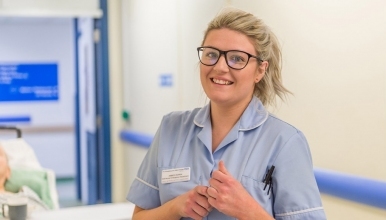 Newly qualified nurses will be supported through the Trust. Preceptorship Course and we will provide a supernumerary period for new starters. Training opportunities exist in the way of supporting shadowing in theatre, and working with the colorectal specialist nurses so that you could understand the colorectal patient care. Online training is available and other study days are encouraged. Come and have an informal chat with me to see if this is where you would like to work!